not done, when it should have been; or made or repaired. 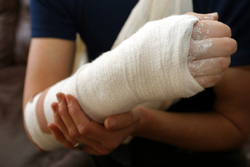 The person or organisation that was careless ('negligent') may have to pay you compensation for your injuries. because you tripped on a paving stone or slipped on a wet floor in a shop. An injury may be psychological as well as physical, so you may be able to get compensation for distress or upset after an accident as well as for the physical injury. You may have been injured in an assault (attack) - see 'What if I am a victim of a crime?' for more about this. What you should do first If you have been hurt, you will first need to deal with the pain, shock and distress you may be feeling. After that, you may want to think about claiming compensation and getting practical, personal or financial support to deal with the injury and its after-effects. Even if you haven't yet decided whether to claim compensation, you should collect evidence about the accident. For example, if you were injured after tripping on a damaged paving stone, you could take photos of the paving stone. Write down details of the accident as soon as you can, while they are still fresh in your mind. If anyone saw what happened to you, get their name and address. If you visit a doctor for treatment, ask them to record the fact that you had an accident. Their records will be evidence that your injuries were caused by the accident, which will be helpful if you later decide to make a claim. For injuries that you can see, photographs of the injury will also be helpful. Make sure you have a note of the date the photos were taken. If your accident happened at work You should tell your employer about the accident straight away. By law, your employer must keep a record of most types of accident. If you are self-employed, you must record the accident yourself. You or your employer should also report the accident to the Health and Safety Executive or the local authority environmental health department, if this is necessary. This is done through the incident contact centre. If you think your employer may not properly record the accident, write to them giving brief details of the accident, and keep a copy. You may be able to receive certain types of benefit after an accident at work (for example, Industrial Injuries Disablement Benefit). To claim them, you must fill in a form from your local Jobcentre Plus. If you are hurt in a road accident, you must tell the police and, if your car was involved your insurance company. The insurance company may refuse to pay out if you don't report the accident. If your accident was during medical treatment If you were injured when being treated, for example, by a doctor or in hospital, different rules apply.